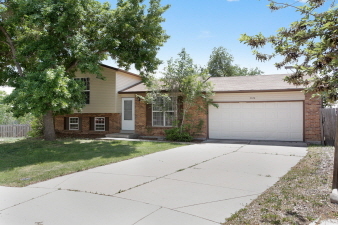 This is your opportunity to CUSTOMIZE this home in beautiful Grange Creek! Quick move in. Super quiet and peaceful cul-de-sac. HUGE back yard with no back neighbors. Backs to massive gorgeous green open space with tranquil trail system. Make this home your dream for entertaining and relaxing. Wood burning fireplace for extra ambiance on those cozy nights. Large rooms and closets. Large master w/ incredible views! Big oversized 2 car garage. This home has tons of potential! Close to schools, parks, easy I76 access, and downtown. So many options. WILL NOT LAST LONG! BRING YOUR OFFER. Buyer to verify all info.